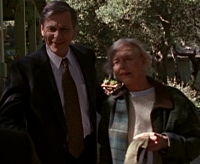 The Cigarette-Smoking Man (now terminally ill) enlists the help of a reluctant Scully in an elaborate con to capture a fugitive from DARPA, a doctor code-named Cobra, who holds the science for curing every human disease. The Cigarette-Smoking Man and Scully go on a road trip and the Cigarette-Smoking Man confesses many of his thoughts and worries. 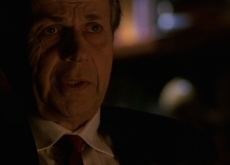 Cobra is executed but the Cigarette-Smoking Man lets Scully live. However he does not give Scully the science as promised, but prefers to destroy it. Season 7 is more than any other the season of the actors: 3 episodes are written by the cast. 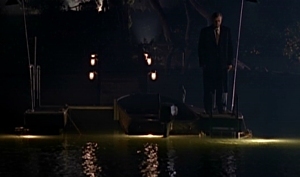 En Ami is William B. Davis’ third pitch to Chris Carter and the first that passed the test to be developed as an episode. In En Ami, Davis’ character the Cigarette-Smoking Man steals the show and Davis writes himself scenes with Scully, when we were used to see him interact with Mulder — he even writes himself a scene with a face-to-face dinner with Scully wearing a beautiful dress! More than an important part of the mytharc, this episode is an interesting character study for (what would have been) the Cigarete-Smoking Man’s penultimate appearance. The science research and experiments done for hybridization and biological warfare are considered here under a more humanitarian light. Scully sees ‘miracles’ — a child dying of lymphatic cancer saved from certain death, a healthy woman at her 118th year — that were performed with advanced technology that she’s very familiar with: she carries it herself (5X03: Redux II)! Scully notes the presence of scars in the back of the neck of the boy and the woman the CSM presents to her. The CSM: “You’re not at all curious? About the chip that’s been put in that boy’s neck? You, a medical doctor who has the same technology in your body? Has witnessed this wondrous ‘miracle’ first-hand?” The chip in 5X02: Redux was supposed to cure a cancer caused out of uncontrolled growths created by hybridization residues of Black Oil in the abductee’s genome. And the science behind these chips can not only cure any cancer, but anything: “It’s the holiest of grails, Dana. It’s the cure for all human disease“! They come from a “closely guarded” “genetic research“. ‘Cobra’, the doctor that is the source of all this, was working for the “Defense Advanced Research Projects Agency“, DARPA, already encountered regarding bioweaponry in Redux. He was probably working for the Syndicate to some extent as well (for him to use science developed in the hybridization experiments). Cobra gets tired of the secrecy and decides to go public; he becomes a “federal fugitive“. His communication with Scully was diverted from its intended source by the CSM. The CSM creates all this elaborate scam around Scully — the visit to the CSM’s offices, the road trip — only to reach Cobra, who had gone under the radar. 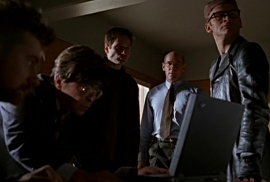 The CSM maintains an liberal stance throughout, as in Mulder’s dream in 7X04: Amor Fati: “You’re free to go, of course. The choice is still yours.” Scully visits the CSM’s office in an apparently normal busy office building. This could be the same building the CSM had a conference in in 6X22: Biogenesis, perhaps the headquarters of the new Syndicate the CSM is trying to build. The fact that all of this is evacuated at the end shows the importance of the Cobra leak to the CSM and his associates. Scully retrieves the disk that contains all this knowledge and the CSM’s henchman the Black-haired Man (last seen in Fight the Future!) kills him. In a very quick instant barely offscreen and off Scully’s eyes, the CSM pockets Cobra’s disk and hands Scully a blank one. The “perfectly executed con” is complete. But as with any professional liar it’s difficult to discern what was part of the con to gain Scully’s trust and what was genuinely the CSM. In their little road trip, the CSM confesses to Scully his thoughts, his feelings, his weaknesses and his hopes for his short future. He is dying from the operation he had in 7X04: Amor Fati (“Cerebral inflammation, a consequence of brain surgery I had in the fall. The doctors give me just a few months.“); the work of his life in the Syndicate is gone (6X12: One Son); he wants to leave a legacy behind, something for which to be remembered as a good man. Scully: “So you want to use me to clear the slate, to make you a respectable person.” By saving the world by curing all disease — the right appeal for Scully, a doctor, as well. The counterpoint for this is his more pessimistic feelings that humanity is, after all, doomed — from its own bestial and selfishly profiteering nature, or from the hand of God (ie the Colonists). What good will alleviating some physical pain will do? The CSM might be able to cure himself with this science, to extend his life, but what good will it do to him? For him to assist powerless in an apocalypse (the colonization) of his own making? For extending his miserable and lonely existence? His will to resist, if there was any to begin with, is completely gone: “I’ve tired of Mulder’s mule-headedness, his foolish ideas of overthrowing the system.” This nihilistic finding makes him destroy the disk and light his eternal cigarette, becoming with it his old selfish self. Throughout the series, he was vulnerable when he was not smoking; lighting a cigarette makes him become the man he tries to escape from but fails to do so. In the end, the CSM prefers to go down with the rest of the world rather than become a saviour to everyone. Whatever happened there, he kills his own henchman the Black-haired Man and lets Scully live, again. Of all the things that the CSM told Scully, one sticks out that particularly moved him and must be true: “I’m a lonely man, Dana.” All the people he knows are either dead, often by his own hand, or he betrayed them; the women he loved (Cassandra, Tena, Diana) are gone. What Scully refers to in the end, “a longing for […] something he could never have“, is human affection, mutual care, love — something he now sees as going on between his son Mulder, and Scully. The CSM confesses a certain affection for Scully, but not an attraction: an affection like the one a man has to the woman that will carry his grandchild. After all, the title is French for “as a friend”.